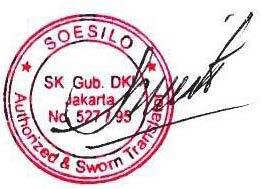 We provide sworn translator and interpreter services throughout the territory of Batam, Jakarta, Bandung, Semarang, Surabaya Indonesia for Indonesian or foreign citizen who wants to have their documents to be translated into or from bahasa Indonesia by a sworn translator. This website owned by Anindyatrans one of sworn translator and interpreter service provider in Jakarta Batam Bandung Semarang Surabaya Indonesia, as you can see at left side is purchase order from Sanofi one of leading pharmaceutical company in the world hired as for the second time to be interpreter for annual audit. This is a proof of our excellent interpreting services to our client and we are also provide other services to support interpreting process that is simultaneous interpreting system with wireless, radio or cable.